How To Successfully Grow Strawberries In Containers? Growing strawberries in containers is simply a great deal of fun and there is little doubt in my mind that it is by far the most popular soft fruit that has ever been grown, and will continue to be a favourite for many more years to come. There are many reasons for this but primarily almost everyone loves the taste of strawberries and they are very easy to grow and to look after. I can also assure you there is nothing quite like the taste of your own home grown strawberries. You can also grow strawberries from seed, though that is a lot more difficult than growing them from plants in a container. We have done a full article on growing strawberries from seed, which you can read by clicking here. 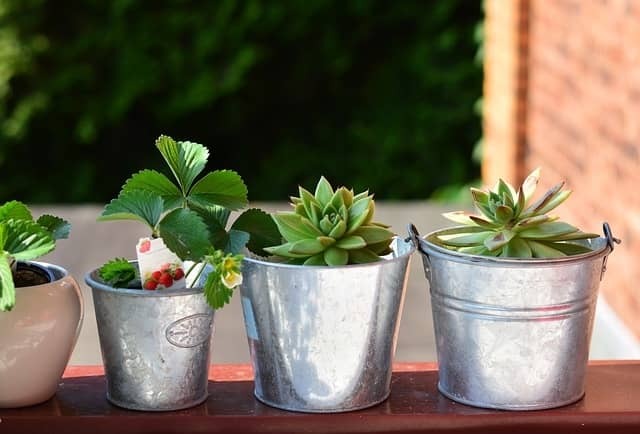 In this article though we will be concentrating on growing strawberry plants in containers. In particular we will be discussing how to grow strawberries in containers in the UK. You can grow them just about anywhere and if you plant them in late summer then the following summer you will have a great crop of fruit with very little work and a great deal of pleasure. The easiest way to prevent them from pests is to grow them in a containers. This ensures they are not attacked by ground pests like slugs. They will however need net protection to prevent them from bird damage, the other enemy of the strawberry. That ground pest control though is one of the key benefits of using containers to grow anything. A typical strawberry plant, if well looked after will yield around 12-24 ounces of strawberries and that is anything between 6-12 good size single strawberries. These will last for around 3-4 years, and you can also grow more plants from these, and continue on just like that. For many of us and depending on climate it is however a short season but with a little planning and knowing which varieties to get, this season can be extended up to about six months. It does of course depend on which part of the United Kingdom you live in. Those living in the South of England and Wales have a wider growing opportunity, than those in the North of England, Scotland and Northern Ireland. That is simply down to the fact that generally speaking, the weather is slightly warmer the further south that you live. Here is an excellent 10 minute video on growing strawberries in a container, which I think you will find very useful indeed. If you plan on using containers then my solid recommendation is to buy the small plants from a good garden centre in your local area. Although you can use seeds in a container, they still take a lot of nurturing and care. To have successful plants, I would always go with ones that have been looked after in a garden centre by gardening experts. The plants are pretty cheap and they all but guarantee you with a high level of success. If there is no garden centre or nursery close by, then you can easily buy these online and have them transported to your door. Personally I like Thompson Morgan for buying my strawberry plants. It's nice to get them with some fruit on them, but more importantly it is ideal to get them with the flower growing on them. The centre of the flower should have a nice yellow flower. Avoid buying dark coloured centres. If you do happen to find darker centres then pinch them out. The dark centres have been caused by the plant drying out too much. Other than that basic check you just want to check that the plant looks healthy overall. 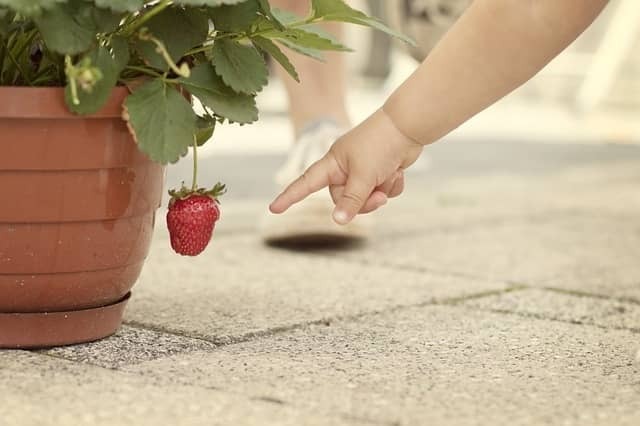 Strawberries have a shallow root, but more importantly they do not like to be crowded. Each plant does like its own space to grow and fruit. So let's have a look at root depth first. An ideal depth for any container is 12-18". In terms of width the wider the better, Each plant needs plenty of room so don't be tempted to squeeze a lot of plants into a container as that would be a big mistake. What Soil Do You Put in Your Container? Drainage is vital for successful strawberry growing. The best choices for that is either to use a sharp sand or Pearlite. Mix about 25% sand to compost for the ideal strawberry planting mix. Pearlite is much more expensive than sharp sand but is a better choice if you can afford it. When mixing the sand and compost make sure it is really well mixed together. You want the sand throughout the compost and not laying on the bottom of the container. I mentioned earlier that these plants will be inside your chose container for 4 years or more. That is why it is vitally important to take your time when planting and make sure the sand and compost are well and truly mixed together. Once that has been achieved, then fill your container to about 2- 3 cm (1-1.5") from the top. Lift the container slightly to a height of about 7-10 cm (3-4") and then let it drop to the ground to allow the compost to bed down into the container. Repeat this a few times until the soil level drops just slightly. The reason for doing this is that strawberry plants like to be grown in a firm bed. The next step is optional but I highly recommend doing this before putting your plants into the container. Add a Mycorrkizal fungi to the compost. This will help enormously in increasing your crop. I prefer and highly recommend the Empathy RHS 360g Rootgrow Mycorrhizal Fungi. Coat the roots of your strawberry plant with this riser and then plant it into the container. Make sure that the top of the plant is exactly level with the compost in the container. If the plant is beneath the surface of the compost in your container, the top of the plant will rot. If the plant is above the surface it will dry out, so make sure it is level with the surface of the compost in your container. Once planted then gently sprinkle with water but do not soak them with water. Over watering is the most common cause of strawberries dying. Strawberries will need to be fed when growing in a container. They like a high potash feed, so something like a tomato feed is an ideal choice. Don't feed them for the first month. After that you should feed them every 2 weeks. Many people believe that you don't need to protect strawberries grown in a container from the normal garden pests. Sadly that is not true, though I wish it were so. Birds will simply not care where they find their strawberries so the container will need some net protection. As the strawberries grow shape them to grow over the edge of your container. If strawberries are left to grow on top of the compost, they will just rot. For those strawberries that remain sitting on the compost, then you can place some straw under those to keep them off the compost. Many UK gardeners now use purpose made strawberry mats to do this, and that is my preferred method. 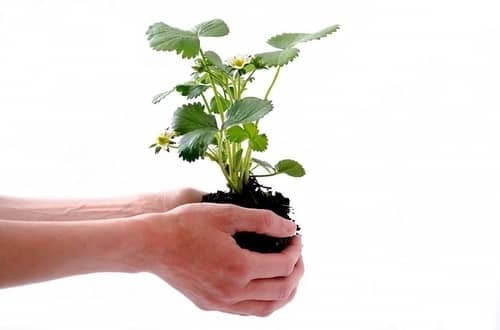 As long as the strawberries are not sitting on damp or wet soil then they will grow well. To the right I have shown the Cambridge Strawberry plant which create a crop of juicy strawberries. They are disease resistant to ideal for beginners to try. Almost everyone will grow the popular summer fruiting strawberry which does have the best fruit and a plant of this type will be good for about four seasons before it reaches the end of life. The Perpetual is a tad smaller and not as sweet with the Alpine being smaller still. Although the Alpine is smaller it is still sweet but lacks the juiciness you may be used to with the summer fruit. This one is my own personal favourite, but for most people it will be the summer fruit variety. The reason I like these is that they will grow in the shade. Finally the Day Neutral if grown under glass will provide strawberries in the winter though this does take a little more work. I get asked quite a lot if you can grow strawberries in pots. The answer is yes you can do that, but the golden rule is one plant to one pot. As I mentioned earlier these plants do not like to be crowded. Use the same compost and sharp sand mix as I described for your container. If these are outside then treat and feed them the same as if they were in a container. If you are keeping the potted plant inside, then they will need slightly more watering than if they were outside. These are of course my own choices but do feel free to try others as each of us has different taste buds. 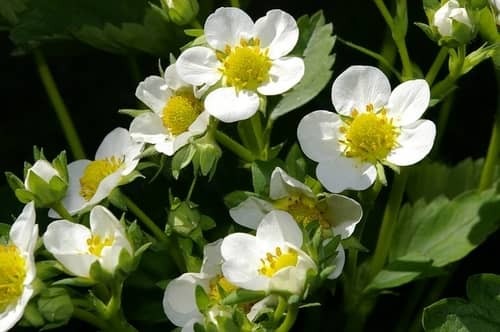 Now that you know the type feel free to search in the strawberry category of my website if you would like to know about how to plant them, growing from seed, in containers, grow bags or any other type of container you can imagine. One thing to watch out for is slugs who will destroy any strawberry plants if allowed to breed and develop. Kill those slugs off as soon as you see any sign of them. They especially like to hide under strawberry plants so look for them there.